Depending on your business type and specific needs, there are a variety of different headsets that may be recommended. 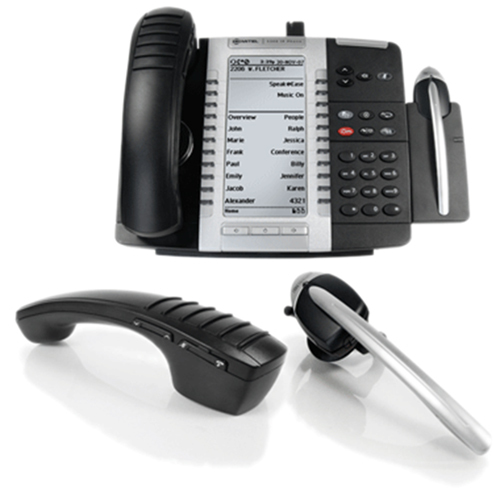 When it comes to the traditional consumer, we typically suggest the Mitel MiVoice DECT Module, a state-of-the-art system that works in conjunction with Mitel’s Cordless DECT Handset and DECT Headset. With this headset, you’ll be able to walk within 300 feet of your desk and still maintain a flawless connection. This model comes equipped with six hours of talk time and an impressive personal range of up to 10 meters. It is the perfect option for individuals who prefer walking around during a conference call or maintaining a conversation from a faraway computer monitor. We have many other options available as well, and encourage you to browse our latest inventory to find the headset that fits you and your lifestyle the best. For any additional questions, please do not hesitate to contact us at 1-800-827-7426. Our service consultants are here to answer any questions, concerns or inquiries you may have. We’d love get a sense of what works best in your professional life, as well as what we can do to further meet your phone needs.